Whether you’re new to curly hair or you’re an old veteran, you’re bound to have questions about curl patterns for natural hair. Curl pattern isn’t the only thing that matters when it comes to natural hair, but knowing about it will help you choose the right hair care products for your texture. In this article, you will learn all about curl patterns so you can restore your pattern, define it, and even loosen it. As you can see, there are four major hair types and several subtypes. Type 1 is straight, and type 2 hair is wavy. Most black women have type 3 or 4 hair and it is either curly or coily. Also note that it’s possible to have a mixture of several hair types on your head, either from birth or as a result of using certain styling methods. Keep reading to find out about types 3 and 4 hair so you can see which hair type you have. Type 3 hair is curly, with the curls advancing into a tighter pattern from a to c. The subtypes range from a looser “S” pattern to a tighter one. Achieving curl definition is easiest with type 3 hair, but it is not without challenges. Type 3 hair requires moisture and styling techniques that are beyond conventional to maintain the curl pattern. Look for lighter weight styling products when you want to define your curls. Type 4 subtypes are probably the most complex, and the haircare tends to be the most difficult to master because the curls are so intricate. Type 4a hair forms a tight “S” pattern, while type 4b hair forms a tight “Z” pattern. 4c hair is the last subtype on the curl pattern chart and it is the curliest of all hair types. In fact, the pattern is more of an “O” and it is coily. Naturals who are type 4 hair have many challenges beyond curl definition. Keeping the hair moisturized, untangled, and breakage-free are just some of the goals. However, overcoming these challenges will lead to a well-defined curl pattern and hair you can fall in love with. If you want to have a well-defined wash and go or have some curl in your high puff, you will need to bring out your curl pattern. Avoid Sulfates and Harsh Chemicals. Sulfates are known to dry out hair and make it impossible to retain your curl definition. Opt for more natural cleansers, conditioners and styling products. Hair products are meant to help, and your hair should look its best after you wash it. If your hair looks better before you begin your wash day, it’s time to look for another shampoo. Nothing destroys your curl pattern more than dry frizz. Use water or water-based products to hydrate, and then an oil-blend like Butta Butta Cream to seal. This will help to define your curls. Don’t stretch it. Stretching will temporarily deconstruct the curl. Stretching is meant to remove the tightness of the curl for manageability and hairstyling. Stretching is very protective for hair, but you’ll need to skip it if you want a defined curl pattern. Avoid Heat. Using heat tools can be destructive to curl patterns. Try non-heat straightening methods instead. Clarify Your Hair. Hair that is weighed down by thick and heavy hair care products has a harder time forming a curl. Clarifying your hair will help to remove product buildup and allow your curl products to work better. Trim Ends. Weak, limp ends will make your curls look stringy. Trim your ends, and your curls will pop more. If you have no curl pattern after a big chop, your hair may be too short. You probably need to wait 2-3 months to see a curl pattern emerge. Use Protein. Protein masks will help to fill gaps in the strand and allow your curl to be whole again. You’ll find protein improves frizz and strength too. However, you need to be mindful of protein overload. If you have heat damage, you’re probably experiencing weak and limp strands when they’re moisturized. When your strands are dry, they are probably brittle and breaking. At this point, you will need to cut off the damaged ends because there is no way to repair them. Once you have trimmed the damaged hair then you can move on to protein treatments are one of the best remedies for heat-damaged hair. The protein patches gaps in the hair shaft so that the curl can be complete. Mielle Organics is an effective treatment, and it’s easy to use. If your hair is damaged, you should do a protein treatment at least once per month. 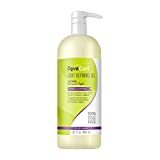 You can also use a protein after relaxer damage and after keratin treatments. Heat doesn’t automatically damage your curls, but there is risk involved. Therefore, it’s good to take some precautions when you do decide to straighten. Remember, before you place any heat on your hair use a heat protectant from the ends of your hair to your roots. Keep the Heat Low. The hair shaft can overheat and melt at 451 degrees Fahrenheit. It’s best to stay well below that temperature. Use the temperature setting that matches the coarseness of your hair. If you have fine, use a temperature below 300. If your hair has medium coarseness, use 350, and if it’s very thick and coarse, use 380. Be sure to use the comb chasing method if you are looking for a slick look. Consider blow drying instead of flat ironing. Blow drying is safer than flat ironing because the heat tool is held at a distance. That’s why you might find you’ve lost your pattern after silk press styles. However, many naturals report losing their curl pattern after Dominican blowout styles too, so it is best to avoid extreme high heat even when blow drying. Do One Pass Only. Your hair heats up each time you pass the iron through your hair. Try passing the iron through your hair only once. Loosening Curl Pattern with Coconut Milk. Use 1 can of coconut milk, 4 tablespoons lime juice, 2 tablespoons extra virgin olive oil, and 2 to 3 tablespoons of cornstarch. Heat the mixture in a saucepan while whisking to smoothen. Let cool, then apply to sectioned hair. Cover with a plastic cap and let it sit for at least 2 hours. Rinse, cleanse, and style as usual. Loosen Curl Pattern with Baking Soda. This is not a method I advise as it will leave your hair dry and prone to breakage. I have read a few articles on how to use this method to achieve a looser curl pattern but the long term effects on your hair is not worth it. So please do not try this. Loosen Curl Pattern with Yogurt. Mix 1/2 cup full-fat natural yogurt with 1/2 cup honey in a small bowl. Apply to the hair and cover with plastic. Let sit for 6-8 hours. Rinse your hair, then wash and condition. Achieving a nicely defined curl pattern can be challenging, but it is not impossible. If you regularly practice the principles and purchase the products in this guide, you should be able to see your curl pattern emerge in just a few weeks. What has been your experience with curl patterns for natural hair and which methods have worked for you? « What is the Best Detangling Brush for Natural Hair?